Excellent Full Day Trip to the beautiful medieval town of Český Krumlov. 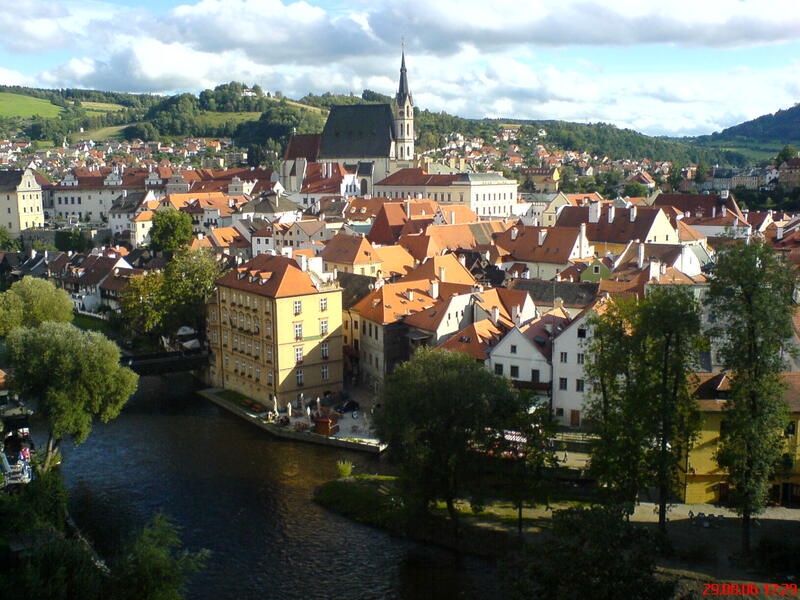 Český Krumlov is in South Bohemia, at a serpentine bend in the Vltava River. Price excludes: tour guide or any entrance fees. Travel time: to the Český Krumlov from Prague is 2hr 43min. 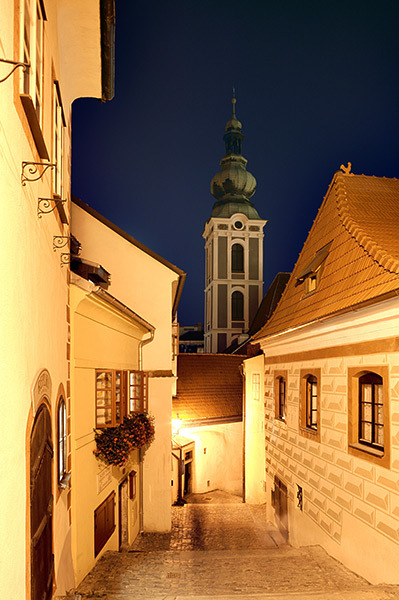 Price includes: Return transport from Prague back to your hotel, waiting fee at Český Krumlov 4 hrs. This charming town experienced its greatest prosperity during the rule of Lords of Rozmberk (1302 - 1602), who chose Cesky Krumlov to become the seat of their kingdom. At this time, Krumlov lay on the crossroads between the Czech, Austrian, Bavarian and Northern Italian lands. You can see the influence of these different cultures that have left their mark on the town and Castle with brushstrokes of the Italian Renaissance. At the end of 17th century, during the reign of House of Eggenberg, the Castle Baroque Theatre was built and the Castle Gardens were renovated. Under the rule of House of Schwarzenberg, Cesky Krumlov gained its Baroque appearance. Cesky Krumlov's Old Town hasn't experienced major changes since the 19th century, other than the demolition of the town's fortification walls and guard towers, and has maintained its historic character. Cesky Krumlov, a UNESCO World Heritage Site, is a lively, cosmopolitan town with a unique atmosphere surrounded by unspoiled countryside. Dominated by a Castle stretching over the meandering Vltava River, Cesky Krumlov's narrow cobblestone streets wind along romantic nooks between patrician houses where you'll find attractive exhibits of world- renown artists, music festivals and concerts, and theatre performances. The cosy inns, coffee shops, and ancient taverns entertain a diverse international crowd. 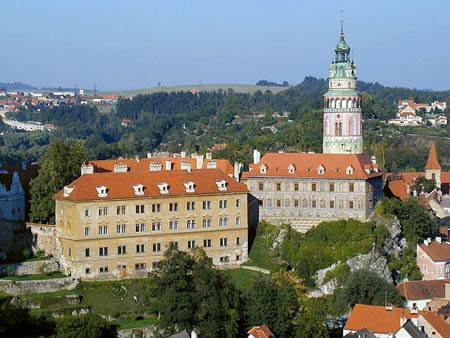 The State Castle of Cesky Krumlov, with its architectural standard, cultural tradition, and expanse, ranks among the most important historic sights in the central European region. Building development from the 14th to 19th centuries is well-preserved in the original groundplan layout, material structure, interior installation and architectural detail. A worthy assessment of the area by both domestic and foreign experts resulted in the acquisition of historic monument preservation status. In 1963, the town was declared a Municipal Preserve, in 1989 the castle became a National Monument, and in 1992 the entire complex was included onto the list of UNESCO World Cultural Heritage Monuments. The mighty complex of the castle is erected on the rock promontory which has been sculpted by the Vltava river from the southern side and by Polecnice stream from the northern side. The castle towers proudly above the refined Renaissance and Baroque burgher architecture of the town below. The town, together with the magnificent Church of St.Vitus and the complex of the castle, creates an unique feature of the whole region. Like a precious pearl, the town of Cesky Krumlov is situated in the valley surrounded with the massif of Blansko Forest to the north and the undulating foothills of Sumava to the south and west. Cesky Krumlov castle website.